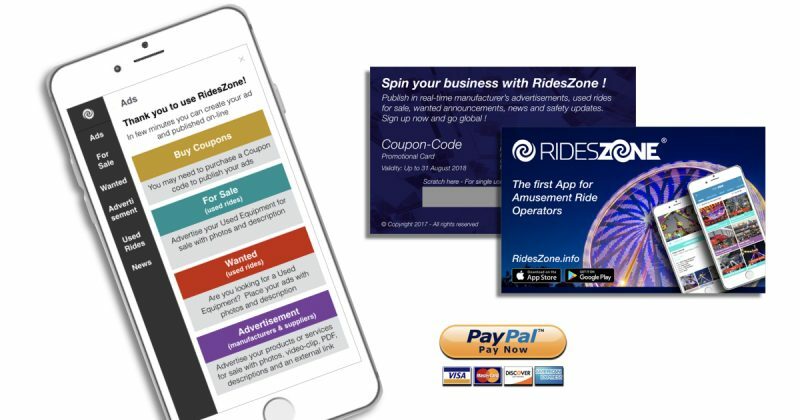 You can buy your Coupon-Code directly in RidesZone App, payment is managed by Paypal. You will receive your Coupon-Code and your receipt by Email. The price for each Coupon-Code is 199,oo Euro (plus VAT, if applicable). All Coupon-Codes can be used just one time. These are special cards issued by RidesZone. Just scratch the silver area in the back of each card to get your Coupon-Code and use it to publish your ads. These Cards will be available during EAS and IAAPA exhibitions or provided by approved distributors.